From the Star Wars universe! Awesome stylized art print advertises Tatooine's annual speederfest - Run to the Suns! Each signed print is a limited edition of 250 pieces. Celebrate the Star Wars universe with an awesome advertisement poster for Tatooine's annual speederfest - Run to the Suns! 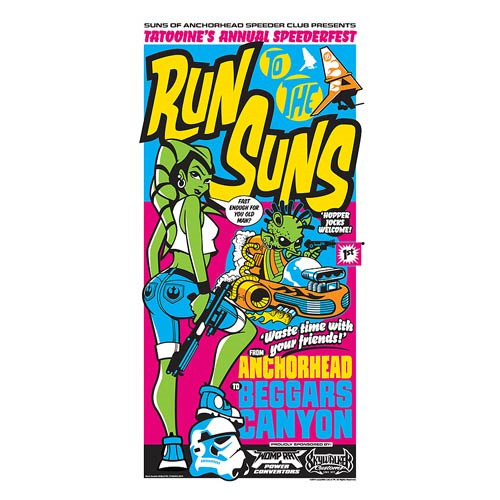 This Star Wars Run to the Suns Silkscreen Art Print features cool stylized artwork based off of the Star Wars series and measures 24-inches tall x 12-inches wide. Signed by artist Mark Daniels, this awesome silkscreen art print is a limited edition of 250 pieces! Ages 17 & up.